All the nice inside bits. First released in the front wheel drive 1993 Allanté, GM's Northstar 4.6-litre all-alloy DOHC V8 has just undergone a major upgrade - and is now to be fitted to rear-wheel and four-wheel drive vehicles. 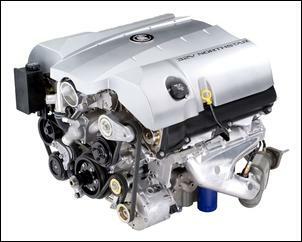 From its infinitely variable cam timing of the intake and exhaust cams, plastic intake manifold, electronic throttle and polymer-coated piston skirts, this is one tricky engine. With 235kW at a free-spinning 6400 rpm (but still with 420Nm at 4400 rpm) it's a great example of the technology of a modern V8. The engine is to be made available in the 2004-model four-wheel drive Cadillac SRX - a car said to bridge the gap between luxury sedans and full-size SUVs, and also in the pictured XLR roadster, where it will propel the car to 60mph (97 km/h) in "under" 6 seconds, and across the standing quarter in 14.7 seconds. To GM's credit, the company has released very detailed technical information and pics of what's under the skin of this superb V8. So hang on for a quick tour through a range of state-of-the-art engine technologies! 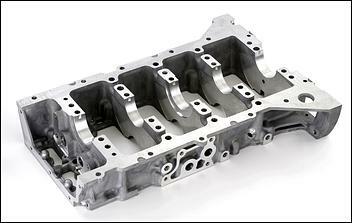 The upper portion of the block is a high-pressure die-cast aluminium alloy component, with cast-in, flanged iron cylinder liners; their outer diameter is machined for consistency. 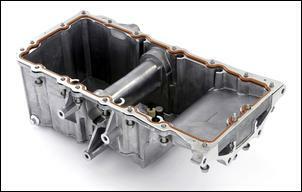 The lower crankcase is constructed of squeeze cast aluminium alloy. Four bolts per bulkhead are used to fasten the two sections for strength and rigidity. Dowels provide alignment for the two halves. Finite element analysis identified the rear face between the engine and transmission and the valley of the block as optimum locations for application of new stiffening ribbing. The crankshaft is constructed of micro-alloyed forged steel and has rolled journal fillets for greater fatigue strength. The crankshaft is fully cheeked and concentrically topped to minimize the external dimensions of the engine, reducing its size and mass, and is internally balanced. A 58-tooth reluctor wheel is machined integrally to the crankshaft to provide accurate positional information to the engine control system. The rod and main bearings are constructed of bi-metallic Al-Sn alloys to minimize wear and provide long-life clearance control. The 4mm-thick, steel-back bearings, in conjunction with the aluminium crank bore, minimize expansion of the bore and crankshaft at high temperatures to maintain proper clearance throughout the engine operating temperature range. Two new dual-belt torsional dampers are also used to drive the two alternate configurations (FWD and RWD) of vehicle accessory drives. Each damper has one pulley integral to the hub and the other driven through the bonded elastomer and inertia ring. Two new flywheels were also designed for RWD applications. 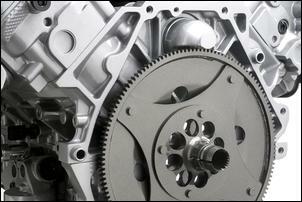 To accommodate the unique torque tube driveline of the XRL, a specifically engineered dual flexplate with an inertia ring (pictured) is used to reduce crankshaft oscillations at low engine speeds. FEM (finite element modelling) was used to model the piston motion and generate a skirt profile for minimal NVH over the whole operating range. Extensive testing was also performed to optimize the ring geometry, tension and end gaps to minimize blow-by and oil consumption. The connecting rod is a forged powder metal component. The cap is impact-cracked, and a combination of the fracture surface and rolled pilot threads on the bolts ensure precise alignment during assembly. The GM-developed process ensures greater precision than conventional machining of the upper and lower halves of the rods. A bronze bushing is pressed into the small end to support the floating pin. Special machining operations around the exhaust valve seats, used to un-shroud the exhaust valves to improve flow. Both inlet and exhaust ports have generated radius machining to improve the flow transition from the cast port to the machined throat and to reduce variation in the flow and mixture motion from part to part. These machining operations approximate a hand "ported" head in production. The exhaust ports have a new oval outlet shape for compatibility with the new specific RWD exhaust manifolds. 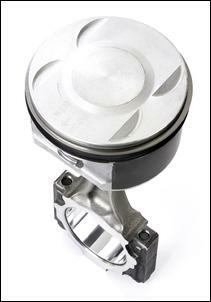 New larger 29-mm forged exhaust valves provide improved breathing. Inconel heads are employed for high temperature capability. The valve guides and valve seats are manufactured from ferrous powder metal. The exhaust valve seat is copper infiltrated for high heat transfer and lubricity. 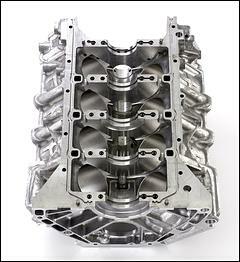 The RWD engine continues to use a powder metal process for the aluminium cam bearing caps. The bottom of all the bearing caps, except those for the thrust bearings, features a patented new "T" slot. 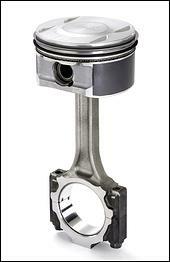 It directs a stream of oil from a supply groove, cast into the lower inlet bearings in the cylinder head, onto the cam and roller finger follower to provide the valve train with a precise amount of pressurized oil. The T-slots are formed with the powder metal process for optimum consistency. The manifold is moulded from glass-filled PA66. 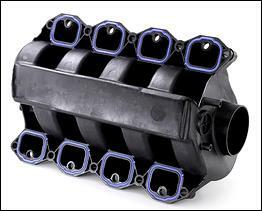 The manifold has a central feed to the plenum to improve induction noise by providing for a nearly equal-length flow path to the runner entrance for each cylinder. 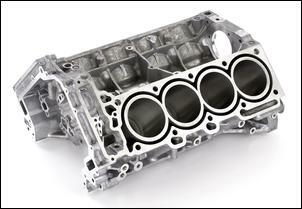 Exhaust manifolds for both FWD and 4WD vehicles are cast from high silicon/molybdenum ferritic nodular iron. The exhaust manifold heat shields are made from a triple layer material for improved noise reduction compared to a single layer heat shield. A full engine cover also provides noise reduction in addition to providing for a finished engine compartment appearance. The new RWD Northstar provides sufficient high-pressure oil supply for stable, rapid VVT response, even at low engine speeds via a new oil pump. The output of the pump has been increased and a new supply circuit to the cam phasers developed. An all-new oil pan, windage tray and baffle system was developed to accommodate the high speed and dynamic lateral performance (cornering, braking and acceleration) provided by the engine. The high-pressure oil supply for the VVT system is supplied from a dedicated passage in the lower crankcase fed directly from the filter outlet. 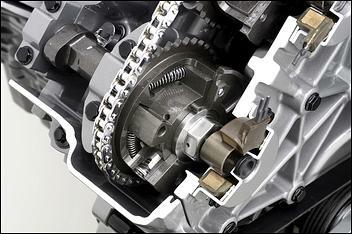 The oil then enters a VVT oil supply tube mounted on the front face of the block in the chain case area. This tube incorporates a secondary in-line oil filter, with a large surface area, for minimum impact on oil flow. 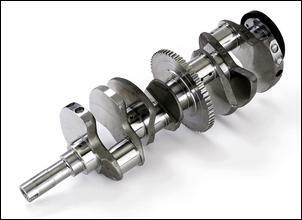 The VVT oil supply tube delivers the oil to upper crankcase, where it is routed to the cylinder heads, into the camshafts, and finally to the cam phasers. The unique oil supply routing with the VVT oil supply tube, plus the integral control valve phasers, enable the system to have the high pressure VVT oil supply entirely routed internal to the engine, precluding the potential for a high-pressure leak. This arrangement also permits the filter to have more effective surface area. Distinguishing features of VVT system include four vane-type phasers, with integral control valves and electromagnets. Four vane-type phasers provide faster response time and a more compact, lightweight design than conventional helical spline phasers. Electromagnets are used to actuate the control valves. In combination with a unique, high-pressure oil supply circuit, they eliminate the high-pressure seal(s) required by solenoid valve-controlled VVT systems, greatly reducing the potential for oil leaks. 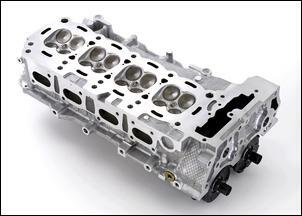 Cam phasing is continuously variable within a range of 40 degrees for the inlet valve timing and 50 degrees for exhaust valve timing. 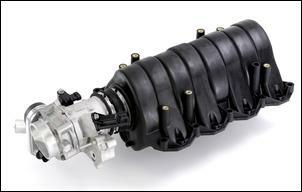 This eliminates the need for an external air pump or complex EGR system (due to the availability of internal EGR). Electronically controlled and hydraulically actuated; the intake and exhaust valves operate independently of one another. 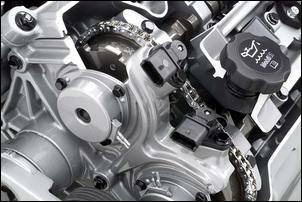 Infinitely variable timing within the range of control. This precision provides improved breathing and cleaner, more complete combustion. This improves the compromise between emissions and performance, from idle to high speed, and between horsepower and torque. The phasers each consist of a housing with an integral cam drive sprocket and cam sensor target wheel. Inside the housing is a four-lobed vane with oil pressure chambers on both sides of each lobe. 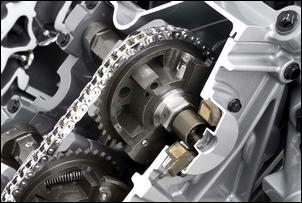 The vane is fastened to the front of the camshaft with a bolt and controlled by an integral, internal control valve. The Powertrain Control Module commands an electromagnet to actuate the valve inside the phaser. Control valve movement causes pressurized oil to flow to the chambers on alternate sides of the vane lobes, advancing or retarding the cam. 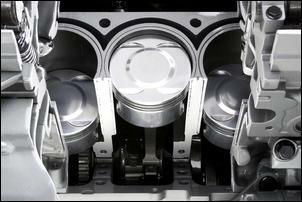 The electromagnets are mounted to the VVT housings bolted to the front of the cylinder heads. Because the control valve is internal to the phaser, only one pressure oil feed is required to both advance and retard the camshaft. A locking pin holds the vanes in their "parked" position during engine start-up to ensure quiet starts. The pin is automatically disengaged when oil pressure reaches a level to assure quiet operation. The camshaft position sensors are mounted in the VVT housing, one per camshaft. There are four camshaft position sensors, one for each camshaft, located in the VVT housings, which determine the movement and position of the cam target wheels located on each of the four phasers. The outputs from the cam position sensors to the ECM are used to determine camshaft positions for comparison to commanded positions. This information enables rationality checks for crankshaft and camshaft position fault diagnostics, and provides backup engine position data for limp-home operation in the case of crankshaft position sensor failure. 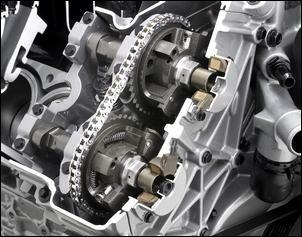 A chain cam drive system has been carried over from the previous FWD engine. 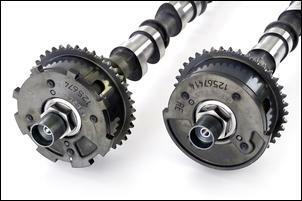 The flame-hardened nodular iron camshafts employ new profiles developed for VVT applications to optimize engine performance throughout the operating range. The profiles employ opening and closing ramps, optimized for quiet operation. 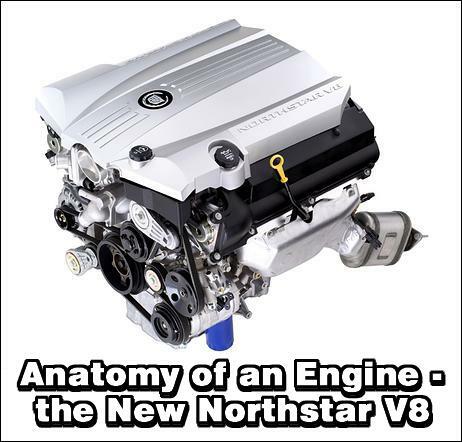 The fuel system in the new Northstar 4.6 litre incorporates a three-piece fuel rail mounted in the intake manifold runners with eight multi-point injectors that inject fuel into the intake air streams at the end of the intake manifold runners on command from the ECM. 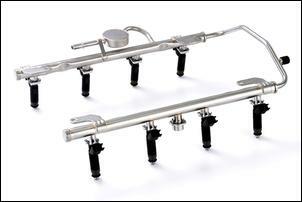 The three-piece fuel rail design allows for easier assembly of the injectors to the rail. 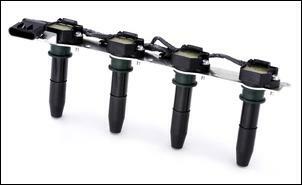 The injectors are a dual cone and dual angle type. The fuel rail is a returnless design that simplifies overall fuel system design and reduces the risk of evaporative emissions. The two rail bank halves and crossover tube are made of dichromate coated carbon steel with o-ring seals between the components. Fuel peak-to-peak pressure pulses are minimized with a damper mounted on one of the rail halves and a 25cc accumulator brazed into the rail inlet tube. Fuel pressure is regulated by the vehicle fuel system at 400 kPa. Electronic "drive-by-wire" throttle control (ETC) receives inputs for driver demands for power via pedal position sensors, and engine control sensors, cruise control commands, traction control events, and transmission shift energy commands via the ECM. There is no mechanical link between the accelerator pedal and the throttle. The ECM appropriately commands the throttle opening to regulate intake air, providing seamless engine control for the variety of vehicle features at the driver's disposal. ETC helps achieve maximum fuel efficiency with high output while ensuring a clean burn. The ETC provides this control without the use of separate modules, such as cruise control, which increases reliability and reduces system complexity. ETC consists of an accelerator pedal control module containing sensors that relay driver acceleration-intent information to the powertrain control module (PCM - the combination transmission and engine management system) while also supplying force feedback (pedal feel) to the driver. The PCM then determines and sets the optimal position for the throttle body air valve with an electric motor. The throttle is an 80mm diameter, straight bore type that allows flexible control and minimizes resistance to air flow at wide open throttle conditions. 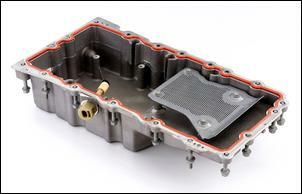 It is mounted on the coolant water crossover, which protects the throttle body from icing. 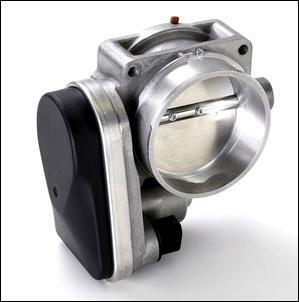 The assembly incorporates the throttle actuator, throttle plate, and throttle position sensor in a common housing. There are two close-coupled catalytic converters - one for each bank - mounted directly to the cast iron exhaust manifolds so heat is transferred quickly to the precious metal catalysts for early light-off, which is important since most emissions occur within the first 20 seconds of operation and the catalysts must be at the proper temperature to be effective. This arrangement, along with the use of variable valve timing, allows suitable light-off without the use of secondary air injection into the exhaust, minimizing cost, complexity and reliability issues. 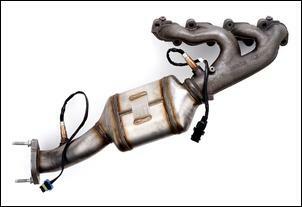 The catalytic converters have stainless steel housings, which are welded to the exhaust manifolds as close to the exhaust ports as possible. Steel tube outlets connecting to the vehicle exhaust system are welded to the outlet of each converter. Two heated wide range air-fuel (WRAF) sensors are located upstream of the catalytic converters (one per bank) to accurately sense changes in the O2 concentration in the engine out exhaust, enabling the ECM to properly control fuel delivery during any operating mode. Post converter heated [presumably narrow range] O2 sensors are located behind each of the converters to diagnose converter function. 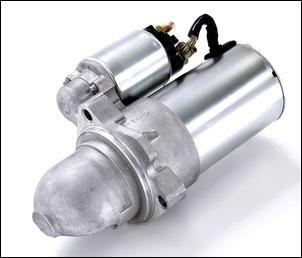 The starter is an ECM-drone starter motor, engaging the engine as soon is it receives an electronic command from the driver via the ECM. There are no mechanical switches. The ECM also protects the engine by shutting down the ignition system if the engine doesn't start within 14 seconds - normally it starts instantly. This is based on the assumption that there may be a major mechanical problem, which would be aggravated if the engine were to fire. The starter is located in the rear block valley. This location has proven to be exceptionally advantageous for starter durability since the starter is out of the direct path of corrosive and contaminant-laden road spray as well as away from hot exhaust manifolds, which is typical for a conventional side-mounted starter. The ECM is a 16-bit, 24 MHz microprocessor, high memory control unit designed to integrate the engine's infinitely variable valve timing (VVT) for both intake and exhaust valve trains, Electronic Throttle Control (ETC), and closed coupled catalysts for meeting emission requirements without secondary emission control systems. The controller is also designed for a GM LAN communication protocol speed of 500 kbit/second and has a 185-pin connection system for enhanced input/output capability. (Currently, 120-pin systems are more the norm.) 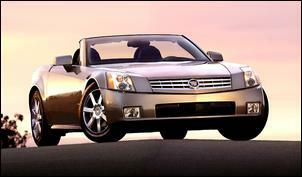 GM's LAN communication protocol is an adaptation of the industry-wide CAN-Bus (control area network). Individual cylinder knock control and fuel control - it controls fuel mixture richness/leanness at each cylinder to keep it at the optimal stoichiometric ratio, rather than averaging all 8 cylinders or by cylinder bank, the typical approaches. Full Onboard Diagnostic (OBD) II capability without a secondary air pump (the Northstar 4.6-litre engine does not need a secondary pump for emission control). Linear lambda control, wide ranging air/fuel sensing for more precise control to meet emission requirements - typically an analog oxygen sensor is used, which is slower and less exacting. 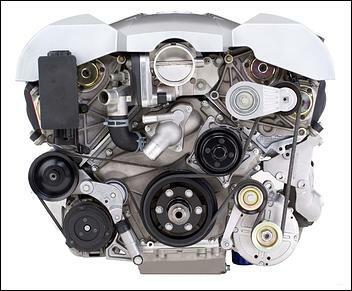 Engine protection functions - including "camel mode," which allows the engine to continue running for another 50 miles before shutting down should it lose all coolant by only operating four cylinders at a time so it runs cooler. The ECM will also shut down the ignition system if the car doesn't start within 14 seconds, assuming a possible major mechanical problem. Engine off natural vacuum (EONV) diagnostics for evaporative emission leak detection. Comprehensive exhaust gas temperature model - exhaust gas temperature is used as a basis for adjusting fuel control: as the temperature increases the fuel control is adjusted accordingly to protect the converter from melting. 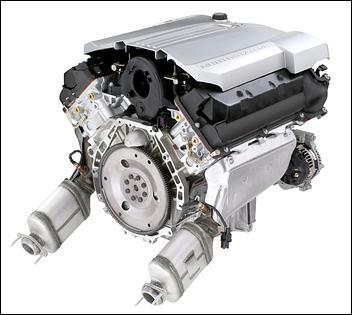 The ECM was co-developed by Siemens VDO Automotive and GM Powertrain. The ignition utilizes a coil-on-plug arrangement, which maximizes spark energy, eliminates spark plug wires and improves electromagnetic compatibility performance. The ECM precisely commands ignition spark event and timing. Four pencil coils are assembled to a bracket for modular assembly, one module for each bank. 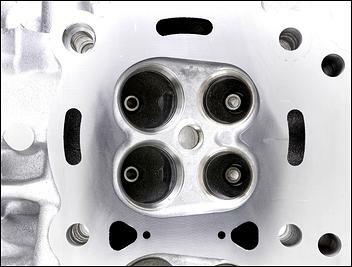 During engine assembly, the coil modules are assembled to the top of the cam covers so that the coils fit into tunnels in the cam covers and cylinder heads, and connect directly to the spark plugs. Electronic spark control retards ignition timing should spark knock occur, re-adjusting engine ignition timing until the knock is gone. Knock sensing is accomplished via the use of two, flat response sensors mounted in the valley of the engine block just below the deck face and mid position fore and aft to allow sensitive and reliable detection of spark knock in all of the cylinders. The output to the ECM is sensitive enough to allow the ECM to control spark timing to individual cylinders when required. The mass airflow (MAF) sensor is an 87 mm diameter hot-film anemometer device with a large measurement range and high accuracy for precise control of air/fuel delivery. The intake temperature measurement and resistor arrangement within the MAF allows automatic compensation for operating temperature and provides good dynamic response. Engine airflow passing by temperature dependent film resistors modulates current through the MAF sensor element. The sensor is located between the air cleaner and the ETC. Powertrain Control Module: Siemens Underhood mounted; die cast aluminium housing Infineon SAK-C167CS-LM BA dual microprocessor Main processor speed - 24 MHz; 3Kbyte internal RAM, 256Kbyte external RAM, 512 Kbyte flash memory. Sensors: 87mm MAF (mass air flow), active crankshaft position sensor (ACPS) (differential Hall IC), dual linear knock sensors, 4 (Hall IC), camshaft position sensors, dual pre catalyst linear oxygen sensors, dual heated post catalyst oxygen sensors, manifold absolute, pressure (MAP) sensor, oil level sensor.